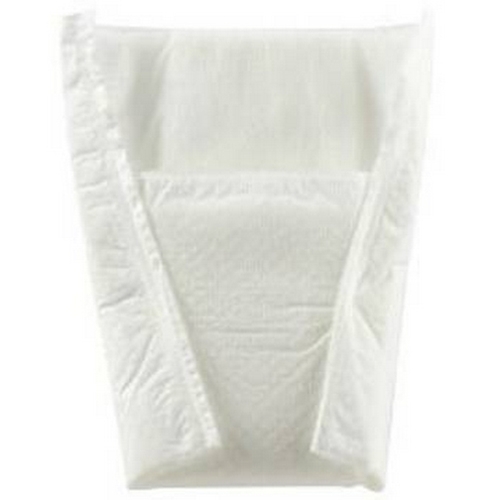 Manhood Absorbent Pouch from HealthyKin.com is designed for light to moderate incontinence. Using a super absorbent polymer, the pouch can hold 250cc of liquid, keeping the skin dry. A strip of adhesive tape allows the wearer to postion the pouch and securely keep in place in his briefs or boxers. Very convenient and easy to carry a spare. Works as advertised except I don't think it actually holds eight ounces. I heartily recommend it over the "pads"; truly made for men only. Comfortable and easy to change out. excellent product, have been using for many years. Have a lot of chaffing on the scrotum as I need to position the pouch low enough to collect the urine. Much better than a large pad tho. Convenient and discreet. Nice product.